Art and graphics students from Manchester High School for Girls have recently been involved in a not-so-top-secret creative project, contributing art work to the Home Office’s newly refurbished Cyber Security Operations Centre. Two rooms at the facility, based at Soapworks in Salford, have been named after two pioneers of computing and cryptography, Ada Lovelace and Alan Turing. 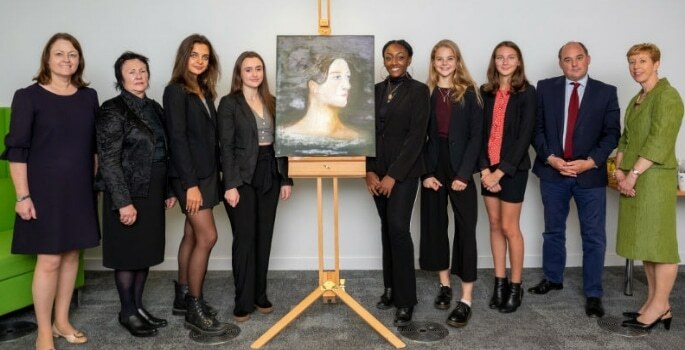 During the summer, A-level Fine Art students, Axelle Sibierski, Connie Baxendell and Michelle Ameh, joined A-level Graphics students, Hannah Farnell and Bethany Woodhead, to produce a series of artworks representing these important figureheads of the early tech industry. In an era when women were routinely denied an education, Ada Lovelace not only broke with protocol but also pioneered what we know today as a computer. As an articulate and strong mathematician, her work on Charles Babbage’s analytical engine gave us what many consider today to be the first ever computer programme, recognising the full potential of this type of machine decades before most others. Turing’s broad and pioneering work in the field of computing included groundbreaking achievements at Bletchley Park, the home of the World War II codebreakers. The Cyber Security Operations Centre monitors the Home Office IT estate to identify and respond to cyber security incidents. Security Minister Ben Wallace visited the CSOC to hear about the work that the staff carry out on cyber security. He said: “It was a pleasure to meet the students from Manchester High School for Girls and to see the impressive artwork they’ve produced. I know the team working at the centre will enjoy the results of their efforts.